Adventures of Louie Anderson as a child, growing up with his sweet-hearted mother, his loud and war crazed father, his 10 siblings, and children at school who love to tease him. The Anderson family takes their annual camping trip at the lake. 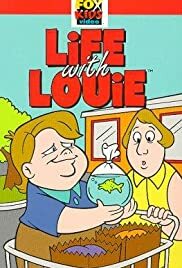 How many episodes of Life with Louie have you seen? Twelve-year-old Andy Larkin, the greatest prankster on Earth, unleashes a flurry of practical jokes on the residents of East Gackle. Comedian Louie Anderson tells a story of one Christmas when he was a kid, growing up in Wisconsin, and how he and his dad brought Christmas cheer to a woman who appeared to have none. A boy named Bobby Generic creates adventures using his overactive imagination. The comical misadventures of Eek, a kind-hearted anthropomorphic purple cat who finds himself in constant mortal danger while trying to help others. The show had two more segments - The Terrible Thunderlizards and Klutter. Italy's master thief and his sidekick Eva are brought to life in this internationally produced animated series from Saban/Fox Kids. A huge hit in Europe. Five teenage girls learn that they have been chosen to guard the walls between parallel universes. For this purpose, they have been given the powers of the elements. Andy Anderson: Louie! Check the Santa. Make sure it's grounded! Louie: Make sure you're grounded! Andy Anderson: I heard that! i love it!!!!! this was a great cartoon... very very very funny, it was non stop laughter. it was a depiction of a boy's life named louie, which captures the innocence and humor of childhood. many of louie's thoughts and dilemmas are very similiar to ones i have went through in my life. and this cartoon tranforms the ordinary into funny. i loved it!!! it was one of the few very good saturday morning cartoons still on...a great cartoon!!! !